Fashion Photograph. Julia Angelova was awarded the Zlatna Igla (Golden Needle) for best fashion make-up artist. The designers Evgenia Zhivkova, Jana Jekova, Milka Alexandrova - Buchi and Fanni Papadopulu, fashion houses Galinel, Enita, MirO, and Parushev, the photographers Danail Shterbanov and Studio MEM as well as the make-up artists Antonella Molaliiska and Svetla Damova, who were among the nominated for the awards, participated very successfully at the ceremony. 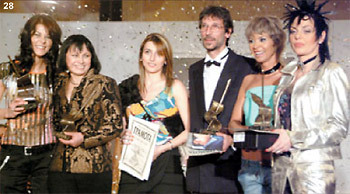 Zlatna Igla for overall contribution to the development of the Bulgarian fashion was awarded to the designer Maria Nedkova who already had the prize in the category Designer of the Year for 1995. The designer Maria Manchenko presented the special collection Nokia, inspired by the particular elegance in the style of the 1950s and 1960s and the clear line, embodying the business woman whose choice is the smart phone Nokia 9300. Official guest at the Zlatna Igla Award 2004 ceremony were the Paco Rabanne glasses and the first Bulgarian brand of glasses Kwiat+. The most recent trends in the sunglasses for 2005 were presented and they reminded in a charming way to those present at the ceremony that spring and summer are near. The designs emanate luxury, elegance and natural identity. The VIP guests, designers, fashion houses, models and participants in the show transferred their festive spring mood to the Spring Ball of the Bulgarian Fashion, organized jointly by Academy for Fashion and Bulgarian Fashion Forum. It happened right after the official ceremony of the awarding. Presenters of the ceremony were the charming Visage top model Iren Onteva and Robin Kafaliev, the host of the Funniest Animals and People on the Planet show on BTV. The splendid show of the Academy for Fashion and the awarding ceremony were attended by many guests, among which were the Parliament members Vessela Draganova, Irina Bokova, Irena Varadinova, Antonia Parvanova, the editor-in-chief editor of Troud daily, Tosho Toshev, Milena Milotinova, celebrity Julia Bull, Baron Gendovich and his wife, Hristo Kourtev and many others. (Golden Needle) award in the Designer of the Year award. 27. Design of Maria Nedkova.